Alrighty then. Keep it up, Claire. 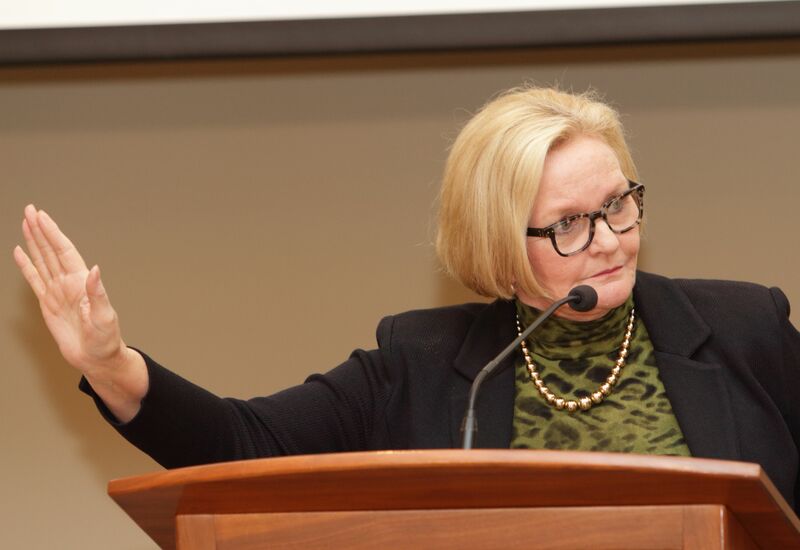 Senator Claire McCaskill (D): Mister President, uh, briefly, this should be, um, a happy day for America. This should be a day that is circled in the calendar as another day as the, as the President of the Senate knows that this is about the American dream. This woman is the embodiment of the American dream in action. We should be celebrating her confirmation to the most important law enforcement position in the United states of America. So why am I not happy? I am sad. I am depressed. Because what we are gonna witness in a few minutes is base politics at its ugliest. Doesn’t get any uglier than this. Because what we are saying today, what my colleagues on the other side of the aisle are saying today, it doesn’t matter if you’re qualified. It doesn’t matter if you’re one of the most qualified nominees for Attorney General in the history of our country. That makes no difference. We have a new test. You must disagree with the president who nominates you. Let me say that again because we love common sense in Missouri and this defies common sense. You must vote against a nominee for the cabinet of the duly elected President of the United States because she agrees with the duly President of the United States. think of the consequences of that vote. Think what that means to the future of advise and consent in this Senate if we all adopt this base politics play to the cheap seat I can’t get elected President unless I’m against Loretta Lynch. If we all adopt that in the future how is any president elected in this country going to assemble a cabinet? Because it will be incumbent on all of us to be against cabinet members who have the nerve to agree with the president who has selected them for his team. It is beyond depressing. It’s disgusting. She is so qualified, she has worked so hard all her life. She is a prosecutor’s prosecutor. She’s prosecuted more terrorists than almost anybody on the face of the planet. And the notion that this has occurred because she agrees with the man who selected her – I think everyone needs to understand what that means for the future if all of us embrace that kind of base politics in these decisions. It is not a happy day. It is a very sad day. I am proud of who Loretta Lynch is. I am proud that she will be Attorney General of this country. I am sad that it will be such a close vote. WASHINGTON – U.S. Senator Claire McCaskill took to the Senate floor today and called out her Republican colleagues for their unprecedented opposition to Loretta Lynch’s 166 day-long nomination for the post of U.S. Attorney General. Lynch-who has had to wait more than twice as long as the previous seven Attorneys General combined for a confirmation vote-will be the first Attorney General to have previously prosecuted terrorists. When Lynch was nominated to be the U.S. Attorney for the Eastern District of New York in 2000, her nomination was approved by the Republican-led Judiciary Committee and confirmed unanimously by the Republican-led Senate. In 2010, when she was re-nominated to this post, Lynch was again approved by the Judiciary Committee and confirmed unanimously by the full Senate. Lynch’s nomination today was narrowly approved by the Senate by a vote of 56-43, and she will replace Eric Holder as Attorney General. Uh, should we ask Senator Roy Blunt (r)?